■Hair: tram H0702 hair / FATPACK @Uber NEW! ■Head Piece: *NAMINOKE*WaterLily with Frog #2 @Enchantment NEW! ■Dress: *The Mystic* WoodFairy Long Dress (Rose) – Maitreya @Enchantment NEW! ■Pose: Le Poppycock *Sweet Madness* Gacha @Enchantment NEW! ■Gold Ball: Air_Frog moon @Enchantment NEW! ■Lotus Set: Titans – Enchanted Lotus Gacha @Enchantment NEW! ■Serenity Style Set: Serenity Style- Enchantment August @Enchantment NEW! ■Frog Prince Set: MOoH! 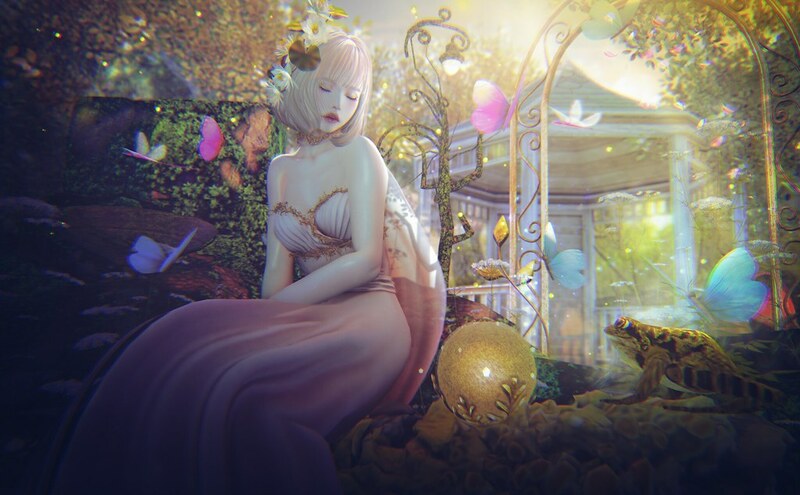 Frog prince Gacha @Enchantment NEW! ■Trees: The Looking Glass TLG – The Kissing Tree @Enchantment NEW!